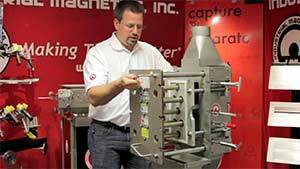 For Immediate Release: Posted On 9/30/2013 By Industrial Magnetics, Inc.
IMI recently released a new demonstration video of their patented Pneumatic Line Housing, explaining why this magnetic separator offers the highest capture rates of metal contaminants in the industry. Regional Sales Manager, Paul Hardy, points out the magnets’ features and demonstrates how to operate and clean the magnet from collected Tramp Metal. Used ahead of processing equipment and bulk load-out stations to ensure product purity and protect machinery from tramp metal damage, the Pneumatic Line Housing(PLH) incorporates a series of 1-in.-diam, 50 MgOe rare-earth magnetic tubes on staggered centers, ensuring that all product flowing through the housing makes repeated contact with the magnets. The resulting capture rate of contaminants exceeds any other magnetic separator available for this application. Their newly patented self-cleaning model (U.S. Patent No. 8,474,629) is a sealed unit that eliminates line pressure drops and surges, is leak-proof up to 15 PSI, and eliminates the need for manual removal of metal contamination. It is ideal for hard-to-reach locations and is suitable for processing dry, powder, and granular materials, as well as in automated processing operations. To view the video, visit the Pneumatic Line Housing product page on their website, contact 888.582.0821 or email imi@magnetics.com.